The sleepy, formerly peaceful, typically Eastern Canadian town of Fredricton is undergoing fundamental transformation in the past year. Now the police are seemingly militarizing their equipment. Image of similar vehicle purchased by Winnipeg police recently. 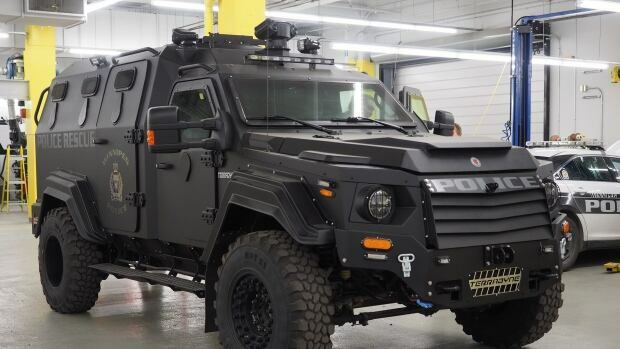 Fredericton police Chief Leanne Fitch says the new $346,000 light-armoured vehicle her force is asking city council to fund would be known internally as an "armoured rescue vehicle" and be a "significant improvement." Fitch made a pitch to city council recently for funding in the 2017 police budget to lease the vehicle. City council will vote Monday night on its budget for next year. If approved, the armoured vehicle would be leased over six years with an estimated annual lease payment of $57,777, or $346,662, said city spokesman Wayne Knorr. 2. Alternative for Germany, (AfD) MP, Björn Höcke, gave a speech in the past week, and this is a brief excerpt from it, on how he views Islam and its role in the West. 3. Islamic State Jihadists Surging into the Philippines. The Philippines has a long and troubled history with Islamic jihad, and the current leader has not felt supported by the Obama administration, and has been looking elsewhere for new alliances such as China. 4. Are you a woman in the EU afraid of being raped? No fear. Now you can buy Safe Shorts. A locking set of underwear with an actual alarm built in. But really there is no danger to women in Europe as this German woman who is pretending to be in a Berlin underpass explains to us all. They even added a little echo to her voice to make it look more convincing. But this saleslady of multiculturalism for FOCUS Online is clearly not that comfortable with areas where migrants go herself, or she would have filmed this on the location into which she Green-Screened herself. 5. France arrests 11 people in Bastille Day truck attack in Nice. Not so much a "lone wolf", by a "mentally ill person" attack after all. The Fredericton police have the backup of the Gagetown Provost corps …about half an hour by vehicule away….they must be expecting some serious trouble. Mindinao should be declared a naval bombardment training range….the jungle WILL eventually grow back. Since 9/11 – IN THE NAME OF ISLAM (SATAN): 32,412 Attacks, 207,606 Killed, 290,881 Injured that we know of. i guess the Muslims must be attacking the Philippines because they do so much bombing in the middle east, isn’t that the only reason they attack anyone? even this useful idiot knows better than to put her money where her mouth is and go walk around an area where she could actually be raped.